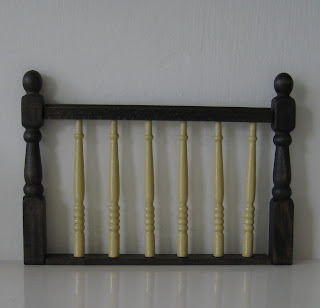 In my previous post (Newels and nosings, 2 May), I'd decided the stair balustrades were to be painted a deep cream in contrast to the dark oak-stained woodwork of the rest. They are done now and I'm rather pleased with the dowdy effect. The assembled parts are still not finally glued together because first I need to mix some murky-coloured acrylic and wash a layer of grime into the turned bits, to stop them looking too shiny and new. I know that weathering or ageing certain aspects of our miniatures points to an obsession with mini details but I also know we are not alone. This time, instead of my caboodle, here is a link to two remarkable collectors, Tom Giannini and Linda Gavin. Don't miss the prompts 'Click to read more ...' for their fascinating stories. This weekend is Dolls House Festival time once more at Kensington Town Hall. Good luck to everyone involved! My planned purchases are very down-to-earth and practical, no impulse-buying allowed. But of course, one can never be quite sure . . .